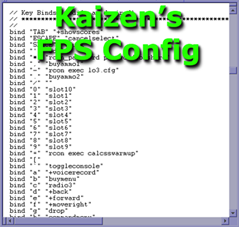 Kaizen’s CS: Source FPS Cfg v1.1 Released! Yes that's right, the cat's out of the bag. After years of keeping my Counter-Strike Source FPS config a secret, I've decided to release it to the public. What many players don't realize is that proper settings are crucial to competitive gaming, so I really wanted to squeeze every known tweak and setting into my cfg to gain even the slightest edge over my competition. While I developed my config primarily for performance, I tried to minimize losses of visual quality and I believe I achieved a happy medium. Another advantage this config has over others is that many commands have their default values listed in case, for whatever reason, you'd like to revert back to your original settings. I tried to make this cfg CAL and CEVO Legal, but if there is any chance I failed, Z-block should protect you. Anyway love it or hate it, I'll let you decide. Thanks to Cognito for cleaning up the formatting! Note: If you aren't happy with my config, there are plenty of other great Counter-Strike Source FPS configs on the Internet, many of which you can obtain from the CAL forums. Hopefully, in the end, you'll find what you were looking for. DISCLAIMER: www.nextlevelgamer.com, Kaizen and all affiliate parties assume no liability for damages incurred directly or indirectly as a result of errors, omissions or discrepancies found within any version of Kaizen's Counter-Strike Source FPS Config. Use the config at your own risk.